The DZT-USAR10-20G2 rifle from DEZ Tactical Arms, Inc. has been built for those serious about long range precision shooting. This all-billet rifle utilizes a DEZ match-grade 4150 CMV steel 20" fluted barrel coated with Black Nitride, and a 5/8"-24 threaded muzzle. 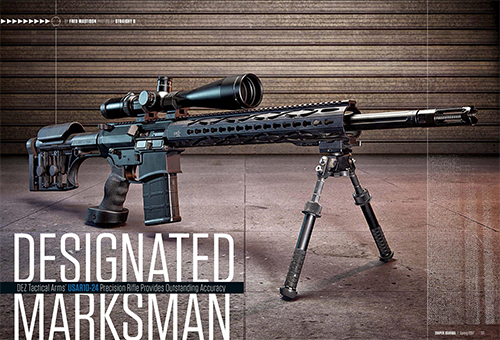 Chambered in 7.62x51 NATO, this rifle is guaranteed to deliver Sub-MOA accuracy from the factory. The USAR10-20G2 features the DEZ Gen2 15" Keymod Rail system, which incorporates a fixed bottom picatinny rail segment for increased durability with a bipod. Also included on the rifle is a DEZ enhanced recoil buffer, an adjustable single stage trigger (2 - 4 Lb. pull) from HiperFire, Luth-AR MBA-1 adjustable rifle length stock, and Ergo Deluxe pistol grip. Customization is key at DEZ Tactical, and this rifle can be special ordered with a specified rail length (12", 15" or 19"), barrel fluting (straight, or twist), and optional Cerakote finish. All DEZ Tactical rifles come with a lifetime warranty against manufacturer defect, and are individually certified to be Sub-MOA accurate. This USAR10-20G2 is also available with a 24" barrel by special request. Please DEZ Tactical Arms, Inc., or your dealer directly for custom options. For standard models featuring our 24" barrel, please see our USAR10-24 rifle. Upper Receiver: DEZ Arms, Inc. Billet 7075-T6 Aluminum with M4 Grooved Feed Ramps and Extended Charging Handle. Bolt Carrier Group: Nitride Coated, 8620 Steel Carrier with properly staked Gas Key - MPI Tested Carpenter 158 Steel Bolt. 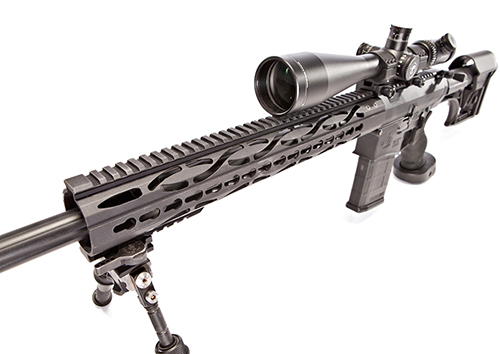 Handguard: DEZ Arms KM10-15 Gen2 KeyMod Free-Float Handguard, 15" Length. Barrel: DEZ Arms, Inc. 7.62x51N Chamber, 4150CMV Nitride Coated, 6-Groove Button Rifling, Lapped, 1:10 Right Hand Twist, M4 Feed Ramped Extension, 20” Bull Fluted Contour, 5/8”-24 Threaded Muzzle, Rifle Gas, Match-Grade Quality. Gas System: Low Profile Gas Block. Lower Receiver: DEZ Arms, Inc. Billet 7075-T6 Aluminum with DEZ markings. Includes DEZ .308 Upgraded Lower Parts Kit. Trigger: HiperFire 24E (2-4 Lb. Adjustable Pull). Buttstock: DEZ Enhanced Rifle Buffer Assembly with LuthAR MBA-1 Rifle Stock. Handgrip: Ergo Deluxe Grip w/ Palm Shelf. Magazine: 1 - 20 Rd .308 PMag. Other: Customizable Options Available - Ask a Dealer, or Visit DEZTactical.com For More Information. Built, tested and certified in-house in the USA. Matching 7075-T6 billet receiver set - adjustable set screw to eliminate receiver movement. Precision 1:10 Match-Grade barrel with fluting for reduced weight and optimal cooling. Adjustable Match single stage trigger. Can set pull weight between 2-4 lbs. 15" Lightweight Modular Keymod Rail System. 19" also available by request. Compatible with most AR-15 & AR-10 parts and accessories. DEZ Tactical Arms, Inc. offers a lifetime warranty on all complete rifles. Our rifles are guaranteed to be free from manufacturer defect. If there is something wrong with your rifle, DEZ Tactical Arms will inspect, and if necessary fix or replace the product with no cost to you. This warranty doesn't cover accidental damage caused by the user, or any damage done from installation or use with other manufacturer's products. Full details can be found in our owner's manual. Proof of purchase is required for any warranty claim. Every rifle is fully customizable with parts we manufacture and carry. Please contact us directly for custom options. Our DZT-USAR-10 line of rifles can be cerakoted with a single color of your choice for no additional cost (Upper Receiver, Lower Receiver & Handguard). Please contact us, or your dealer before ordering if you want your rifle cerakoted. Please allow up to 4 extra weeks delivery time for cerakoted rifles. This rifle comes shipped without optics. Available for an additional fee.